The Adventures of Bebe and Jolie | Dog Product Reviews, Health, Advice and more: Bebe and Jolie's Favorite Food EVER! Bebe and Jolie's Favorite Food EVER! Cute right? I'd like to tell you all that the packaging of this brand of dog food is originally what drew me to it, and how could it not? My dogs practically look like they modeled for the bag. However, I have been a big fan of the Solid Gold brand for quite some time. 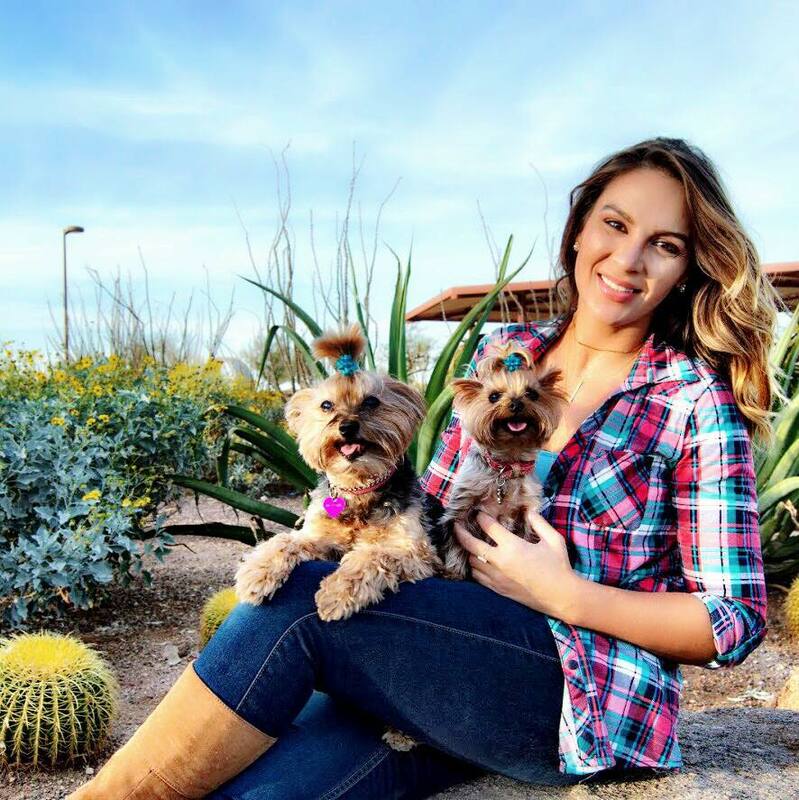 In fact, there's a blog post I wrote 4 years ago where I was supplementing low-fat dog food in support of my dogs' canine pancreatitis. Solid Gold was what I used back then, and they still continue to surprise me with their quality kibble. Aside from the adorable packaging what I really enjoy about this kibble is that first and foremost my dogs enjoy it and that it is actually good for them. Over the past few years, I have purchased about 20 of these bags of food. They have different proteins and varieties. If you read and monitor your pet's fat and protein intake, Chewy.com always lists photos of their dog food, front and back, along with a text box portion in the description stating exactly what's in the food. I really like that. Solid Gold offers various options in the Mighty Minis food. 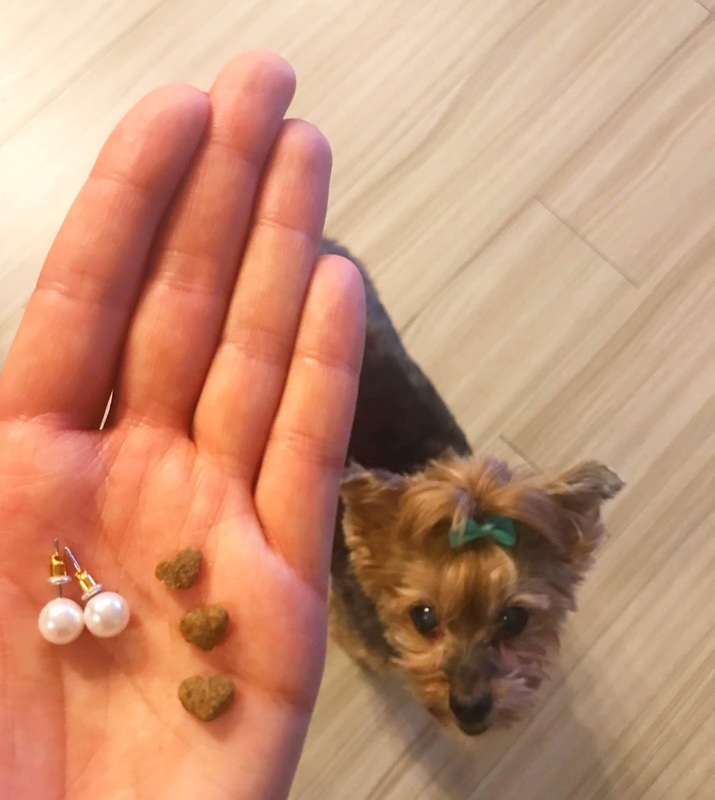 I specifically purchase the Mighty Mini, because as my dogs are tiny and have some difficulty chewing I am relieved to know that the kibble is ultra small, and might I add, ultra cute? The kibble is in the shape of...drumroll...tiny, little hearts! So tiny in fact, that I placed some small delicate pearl studs as a reference for you to see. That's pretty small, isn't it? You can see Bebe is staring me down as I hold the kibble in my hand. I cannot make this stuff up, my dogs really and truly do enjoy this dog food. These are all grain-free which is a nice added bonus for sensitive tummies! Since I control my dogs' diet I've only ever purchased the Salmon and the Chicken, and they really enjoy those two! I am never without a backup in the house, and so when Chewy decided to feature this product in this months Influencer program I just about screamed. The Mighty Mini foods are made with healthy Omega 3 & 6 fatty acids which are important for skin and coat health. This food also has live and protected probiotics which is essential for a healthy gut and digestion. Their number one ingredient in the kibble is the protein! So for us, the protein is always either chicken or salmon which helps to build healthy and strong muscles. Lastly, but certainly not least, the kibble has nutrient-dense superfoods for your pups immune health and wellness. That's pretty pawsome isn't it? Oh, and the food is made in the USA, is grain and gluten free, has no artificial flavors or preservatives added and is made without any potatoes, corn, soy or wheat! We'd think that deserves a high five to the fine folk over at Solid Gold and when I told my little one to give me a high five she gave me one down low! *I received one small bag free of charge from Chewy.com in an exchange for my honest review. 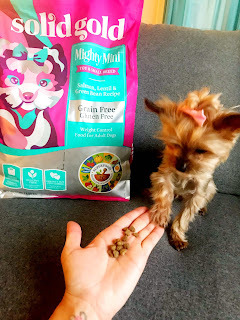 This brand is honestly my favorite when it comes to healthy, holistic kibble for my fur kiddos. 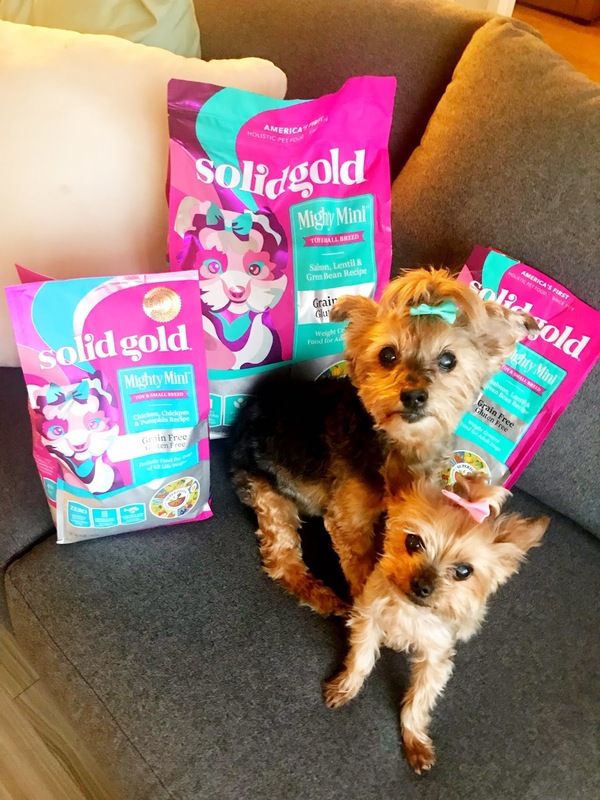 If you're an extra dog mommy like me and concerned with weight, fat and pancreatic issues I highly, highly recommend the Solid Gold brand. I've been a fan for over 4 years!